Another find in Cooking Light magazine. This was a reader submitted recipe so there's no link on the website. In the magazine they use canned pizza dough. I opted for crescent rolls because they cut down the calories and fat per serving and I wanted something more flaky. I made two different versions, one using turkey sausage, cheddar and mexican cheeses and another using chopped ham, cheddar and swiss. This is my modificiation since the meat I used was already cooked. Heat meat choice in skillet, add bell pepper and onion and cook for a few minutes. Add eggs and scramble the entire mixture. Roll dough out onto a baking sheet. Leaving 2 inches on other side layer spread egg mixture down the middle. Slice strips on either side and fold over. (As you can see on mine, I didn't like the braid so I just folded over on the second one. Well, that one didn't get cooked all the way so you might want to braid). Bake according to directions on the crescent roll can. I just sliced these up into their individual portions, covered them and left them on the baking sheet. John and I grabbed a piece and reheated in the microwave for about a minute per slice. One slice is 5 pts. 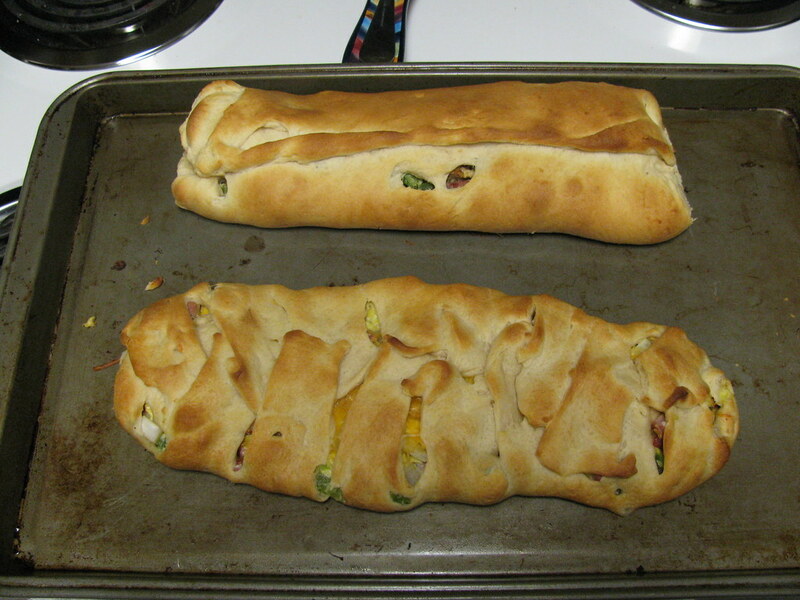 I use fridge pizza dough to make all sorts of calzones and bakes for dinner--it's so easy and convenient! Guess Who Fixed the Shower?